Ian Hutchinson made it two wins in the day when he won a sensational TT Superstock race on his Padgetts Honda. But his 8.77s winning margin over Guy Martin doesn’t tell the whole story. For the majority of the race the race lead was never more than one second with the first lap alone seeing four different leaders and the lap record was smashed repeatedly, Hutchinson raising it to a new high of 129.746mph. It was the Yorkshire rider’s third TT victory and his second of the day after winning the earlier Supersport race. For a time, it looked like Martin was going to take his first ever TT win when he led by three seconds at Glen Helen on the third lap but by the end of the lap his lead had been whittled down to an almost unbelievable 0.04seconds! Hutchinson had lost time at his pit stop when the filler cap wouldn’t go in but he absolutely flew on the last lap and, having broken the lap record on the second lap, he smashed it even further on the final lap with a speed of 129.746mph. Martin had to settle for second once more and Keith Amor took third to make it an identical 1-2-3 to the earlier Supersport race. As the field completed their first lap, it was John McGuinness who led from Hutchinson and Amor with Martin charging up to fourth, the difference between the top four just 2.39 seconds. 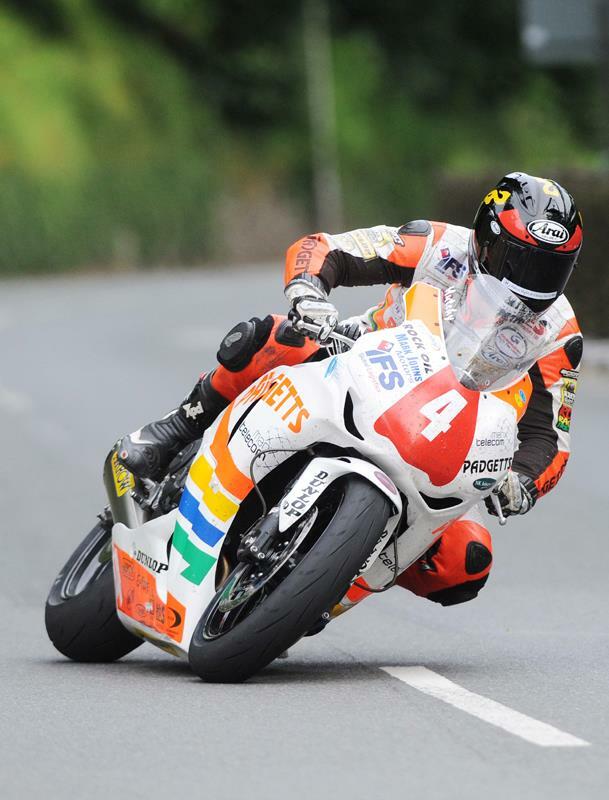 Bruce Anstey was an early retirement though to compound a miserable day for the Relentless by TAS Suzuki rider. As the front runners approached half distance the race was turning in to a two-way fight between Hutchinson and Martin. The Yorkshire rider had a two-second lead as they came in to refuel, both riders having smashed the lap record, but McGuinness was suffering from tyre problems and had a major moment at Greeba Bridge, his rear tyre stepping out as he exited the left hander. Hutchinson’s pit-stop problems meant Martin took over once more, his lead now three seconds, with Amor continuing to hold station in third although it was now Steve Plater up to fourth as McGuinness slipped further back. By Ramsey, Martin’s lead was just 0.3 seconds as Hutchinson really began to charge and they were almost dead level as they started their final lap, the gap just 0.05seconds after 113 miles of racing! The race was anyone’s, and one of the best ever witnessed at the TT, but Hutchinson was proving unstoppable and an amazing final lap of 129.746mph saw him take both the win and the lap record, his third TT win in total. Martin had to settle for the bridesmaid spot once more with Amor in third. Plater and McGuinness took fourth and fifth for the Padgetts team, Hondas again filling the top five positions, with Conor Cummins, Gary Johnson, Carl Rennie and local rider Daniel Kneen, again performing brilliantly, completing the top ten. The race also saw Jenny Tinmouth become the fastest female ever to have lapped the Mountain Course when she lapped at 116.483mph on her final lap, beating Maria Costello’s 2004 lap by 17.72 seconds.